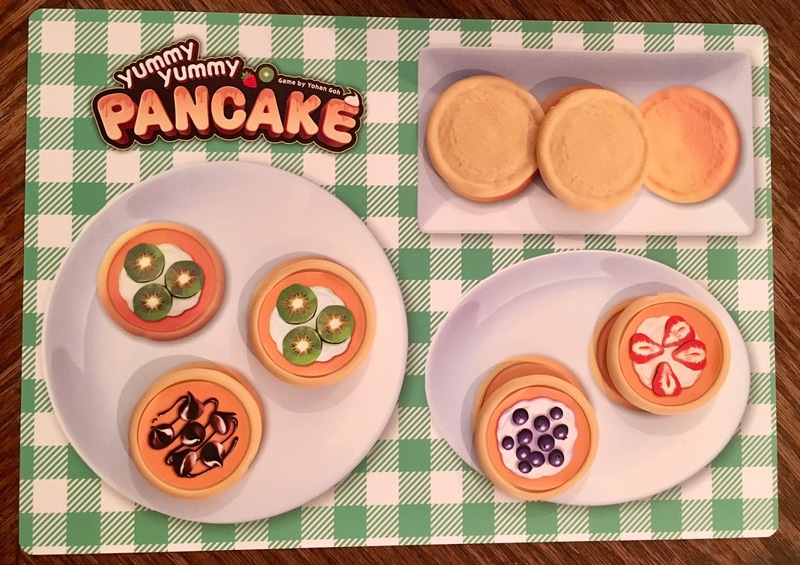 In Yummy Yummy Pancake, you are flipping pancakes and identifying what type of topping is on certain pancakes. Are you the master chef? Or are you the master pancake eater? Start by placing all pancakes out on the table face down. 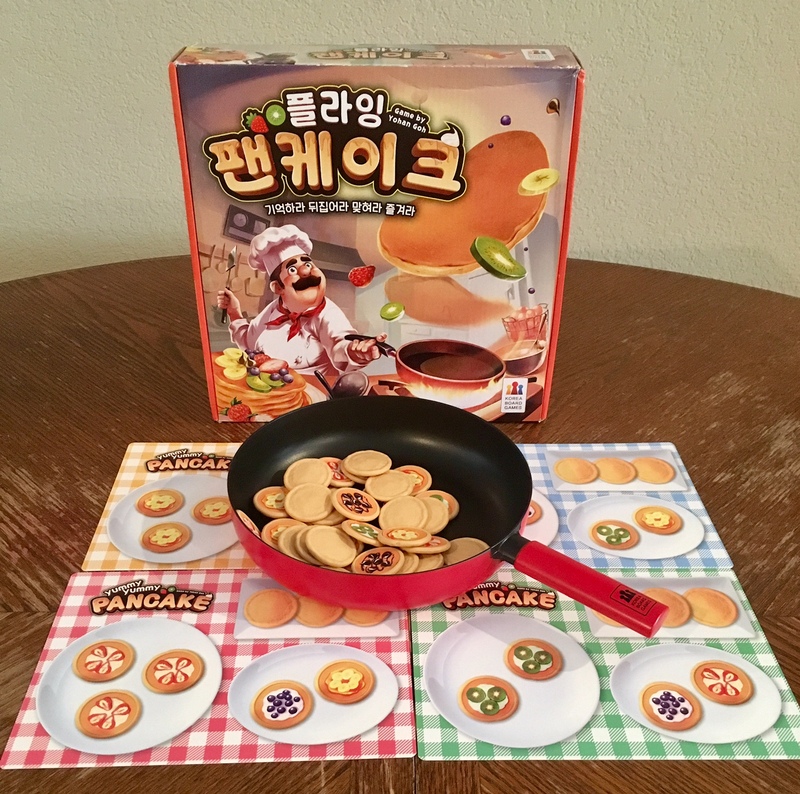 The first player will be the first chef and will draw 8 pancakes and put them in the frying pan face up. 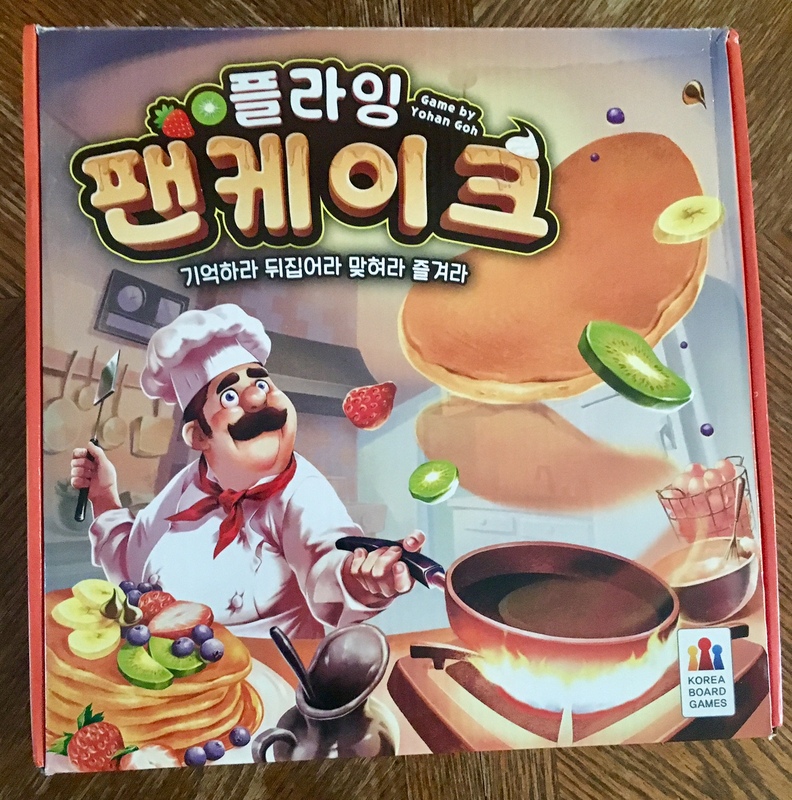 Players will then try to memorize the types of pancakes there are in the pan. The chef will try to flip the pancakes over in the frying pan. If the player is able to flip over 5 or more pancakes, they receive one face down as a bonus. The chef will then choose one flipped down, look at it, and ask one of the other players what type it is. If the player answers correctly, the player gets the pancake, if he is wrong, the chef gets the pancake. The chef will continue until there are no more pancakes faced down, or he doesn't want to share anymore pancakes with anyone. The next player will now be chef and will start by adding more pancakes to the frying pan until there are 8 total. The first player to get 12 pancakes, wins. Spiel '17 promo boards change the game to add a little more strategy. 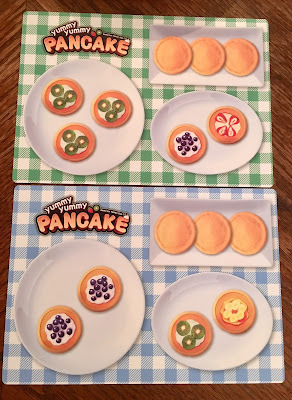 Each player starts with a board that shows what type of pancakes they will need to complete their plates. There is an easy board with less pancakes on it, and a harder board with more. Chocolate pancakes are used as wild and can be used for any pancake on your board. First one to complete their board, wins. The theme is all about pancakes. This is a dexterity game, where it really benefits you to flip the most pancakes over at the same time. 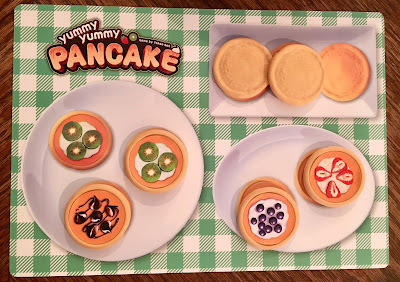 This will give you a bonus pancake for yourself and make it harder for the other players to choose what topping is on the random pancake you choose for them. The art is nice and simple, perfect for a children's game. 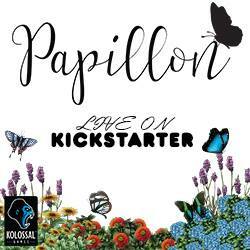 The components work for the game. The pancakes seem a little small for actual pancakes, but if they were bigger, it would make it harder to flip. The box uses the thinner cardboard. 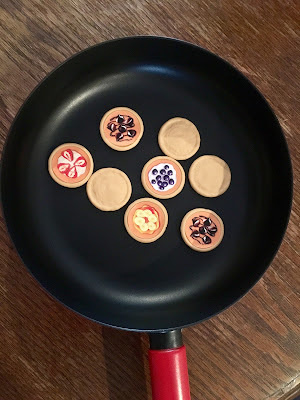 The pancakes are plastic, and the frying pan is plastic. The frying pan will last for what the game needs, but if your kid left it out and someone stepped on it, it would break. But it's a perfect toy frying pan. Fun theme. Fun for kids to play. The dexterity aspect of flipping something in a frying pan is just fun to do. The game then tests memory and if playing with older people, you might be able to bluff some. 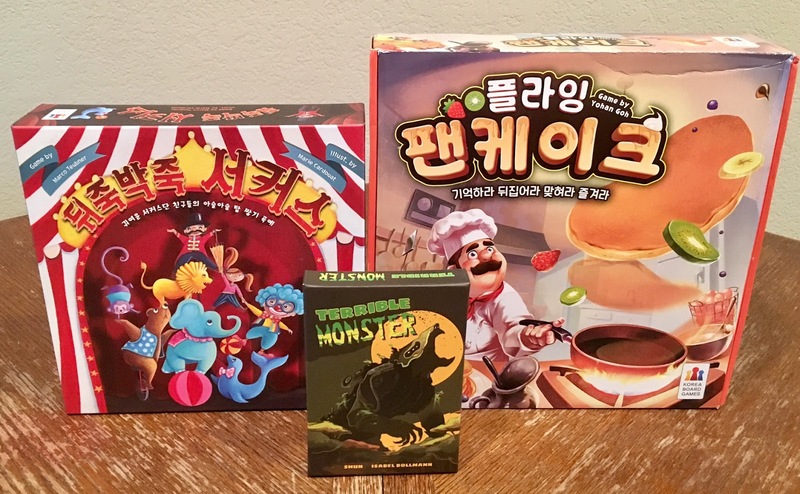 If you are playing with the Spiel promo boards, other players can try to stay away from toppings that you might need. The game almost purely tests dexterity and memory. Such a genius idea for a children's game. Besides playing the game, my 2 year old liked just putting the pancakes all in the frying pan and pretending to flip it, like we were doing. This game was actually enjoyable for me as an adult. 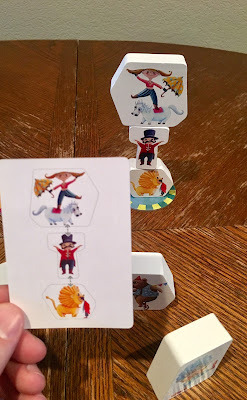 Players who like dexterity games or children's games will need to play this game. I am giving Yummy Yummy Pancakes a 6.5 out of 10 super meeples. Miss watching the acrobats at the circus? 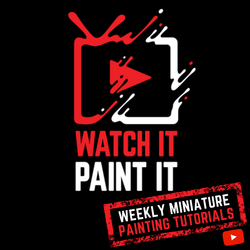 Now you can decide what amazing tricks they do. Who will be on bottom? 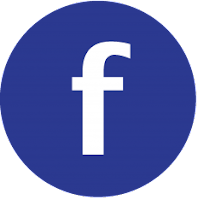 Will you add more characters to one podium than the others? You decide with this dexterity acrobatic game. 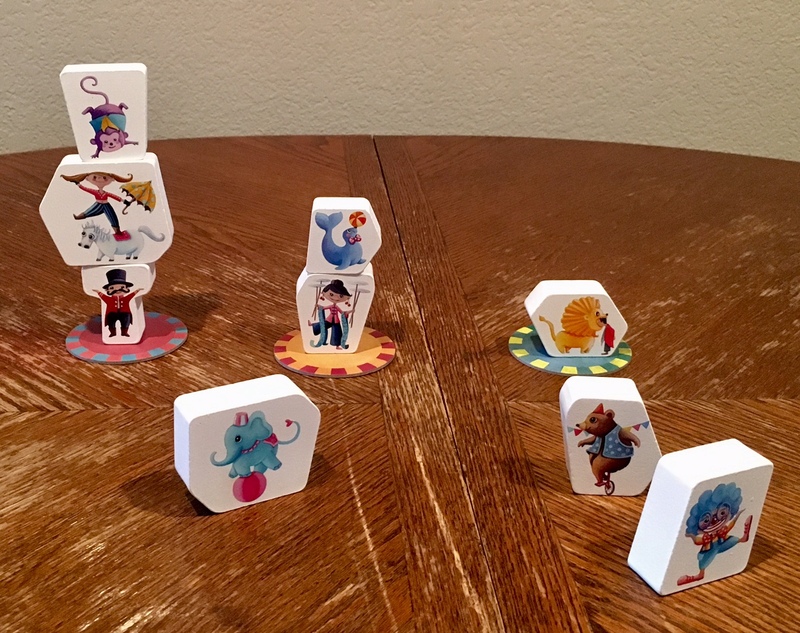 Place 3 podium tiles on the table with the character blocks around them. Shuffle the cards and deal each player 4 of them. The youngest player chooses who will start. On your turn you will take a block not in play and put it on top of any existing block stack or on an empty podium. Or, you can move a block stack in play by only touching the bottom block and moving it to another existing stack or onto an empty podium. Blocks have to be stacked in the upright position only. You cannot reverse the previous player's turn. If the blocks ever fulfill your card, you can yell "photo time" regardless of whose turn it is. Place your fulfilled card in front of you, and draw another card. If you drop or knock over blocks, your turn ends immediately and discard one of your played cards as a penalty. The first player to play 7 cards wins the game. This game is a dexterity game more for children, as it is very easy as an adult to move and balance the blocks. But its not just a dexterity game, you will need to decide which configuration to go after first, and with the fewest changes, how you can complete the next card to be the first to 7 cards. 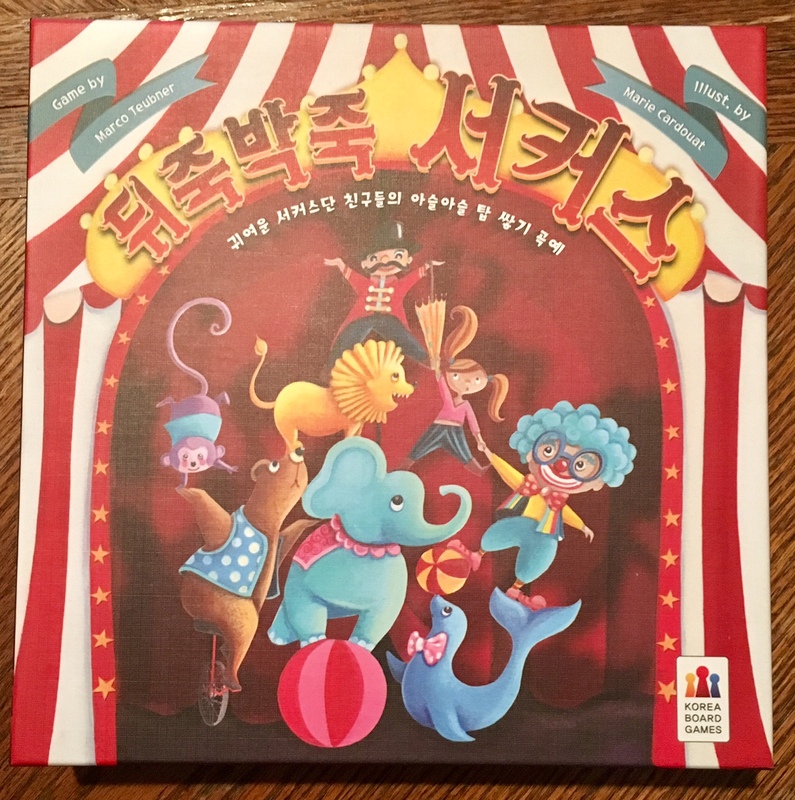 The theme is about the circus being back in town and there are breathtaking acrobats performing who balance themselves in different orientations to form almost impossible moves. 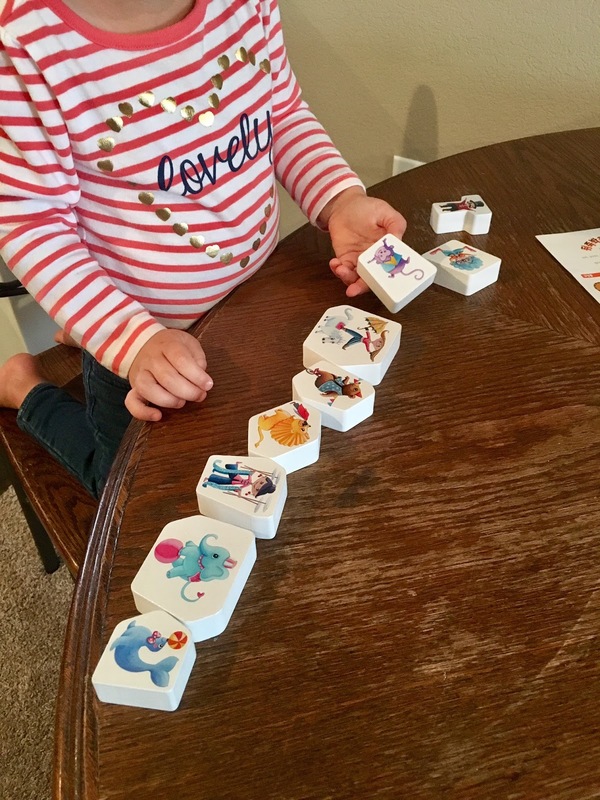 The components consists of 9 blocks painted nicely with different characters on them, 3 podium card board tiles, and 48 cards. The artwork is simple and appropriate for kids. The game play is very fun for kids. I like the types of different cards you have to score. Some depend on placement order, some depend on which podium they are on, and some depend on characters being stacked exactly as shown. Length of play is not too short or not too long. The blocks are very easy to stack, and for some kids it doesn't seem to add much difficulty to the game. For little ones, you will need to explain the different types of cards and what they mean as they are hard to understand by just looking at them. This was a great fun game that is so simple, yet has great fun game play involved with it. This game also helps to develop some strategy by deciding which card to go after first. Dexterity is just the perfect mechanic for kids. This is a great dexterity game. 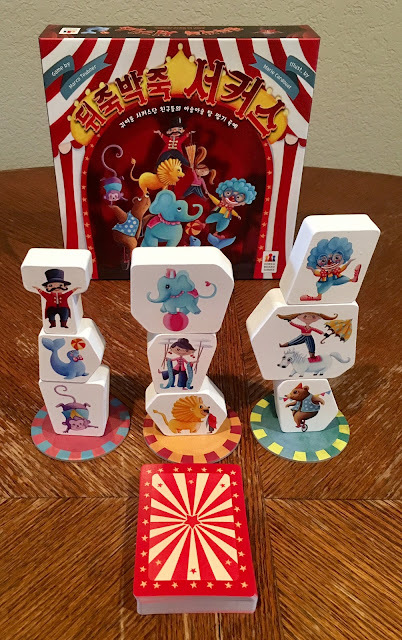 Players who like Jenga, Animal upon Animal, or Rhino Hero will like this game. 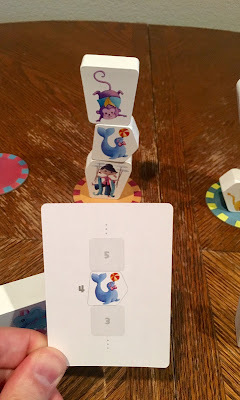 I am giving Topito a 6.5 out of 10 super meeples. You are in a swamp with monsters. 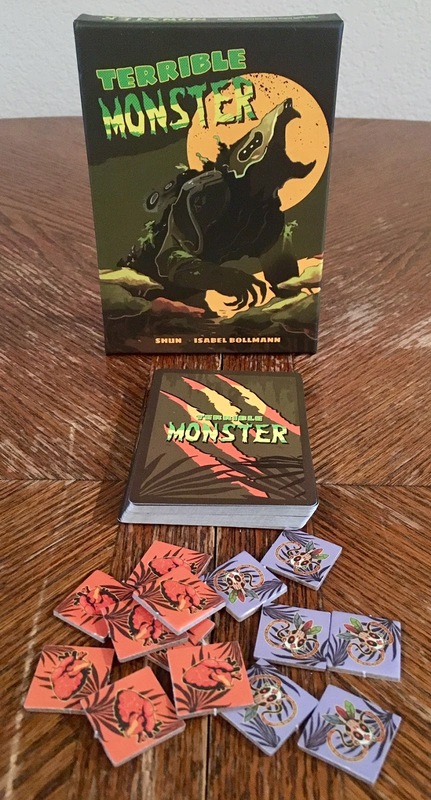 Try to outsmart your opponent by summoning monsters at the best time to defeat them. 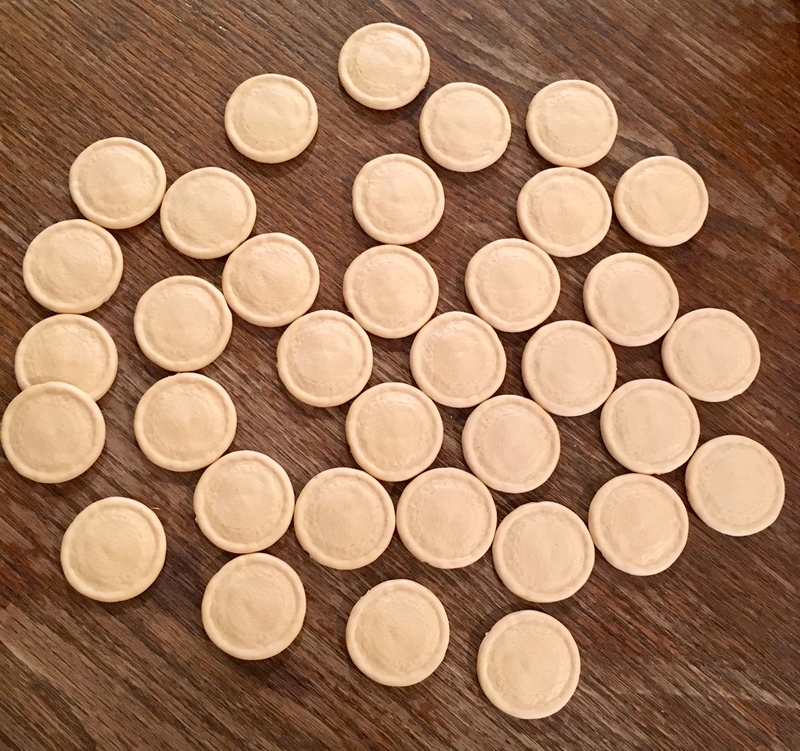 Each player starts with 4 life tokens and 2 counter tokens. Players are dealt 5 cards. The first turn starts differently as you will play a card. You will perform its action by either playing a monster in front of the other player, or doing the action it reads. The next player and all turns following players will draw 1 card from the deck and play 0-2 cards. At the end of the turn hand size will need to be 5 of less. When playing a card, your opponent has a chance to make it ineffective by using a counter, the player who played the card can make it effective again by playing 2 counter tokens. You will play cards in hopes to defeat your opponent. Once someone's life tokens are gone, the other player wins. 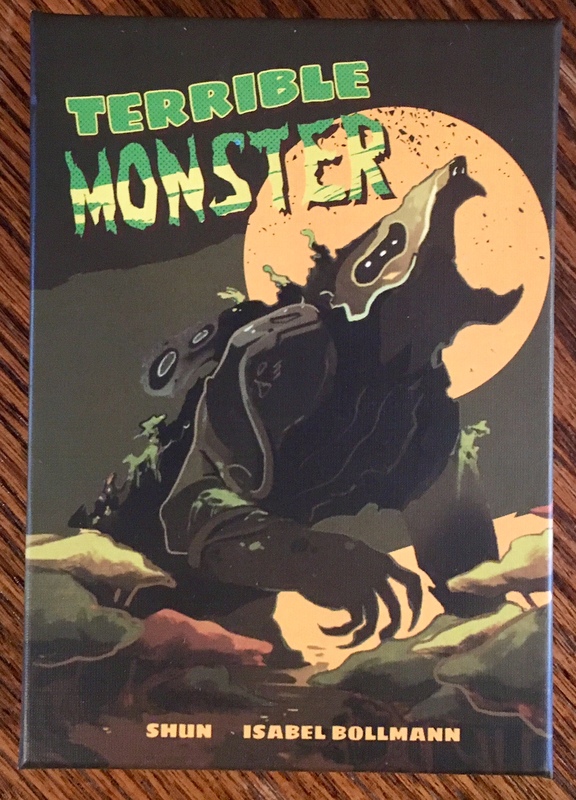 You are deep in the swamps and you will need to summon the terrible monster to harness its power and settle the struggle for supremacy. The mechanics consists mostly of hand management. You will need to play the right card at the right time. 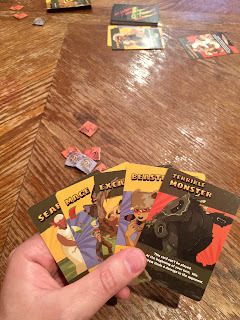 The artwork is nice and simple with fun little illustrations on each card. The components consists of cards and cardboard counters. Game play is short and to the point. There is some strategy of when to play some cards, and when to hold off. It's really easy to lose the game when you have no decent cards in your hand. Sometimes it's not who is better at playing the game, but more of luck. When playing the game, you don't feel the theme. 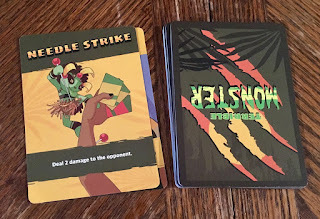 On some of the cards, the text on the card is hard to understand what the action actually is. For me, it would be hard to play this game more than 10 times. 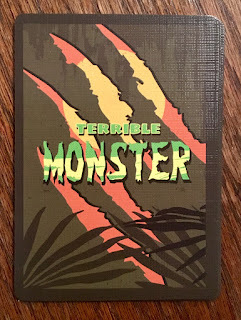 Players who like short cards game would like this game. 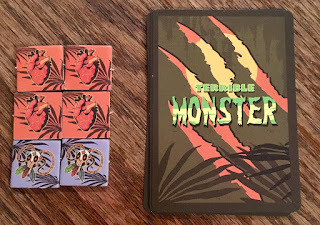 I am giving Terrible Monster a 6 out of 10 super meeples.